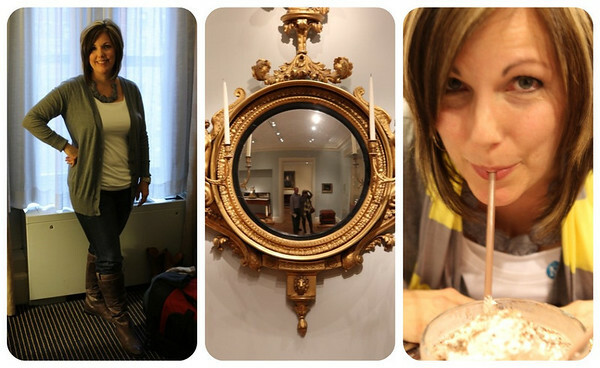 Since it's that time of the week again (WIWW) I thought I would start my NYC trip recaps with a look at what I wore. 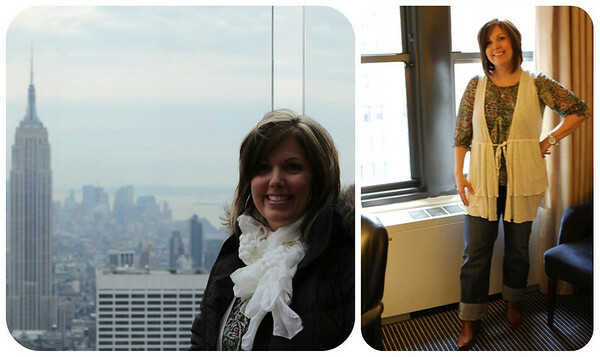 My husband and I were in New York over the weekend for a little getaway and he was a pretty good sport about snapping a photo of my outfits each morning before we headed out for our Big Apple adventures. Thanks babe! Day 1 (also travel day): peasant blouse & long vest: stein mart, cuffed jeans: lucky brand, pointy toe boots: lucchese (cavender's boot city). Later I added a beige ruffly scarf from forever 21 and my new puffy down coat (which was a small toaster oven but much appreciated and needed from land's end). Day 2: grey boyfriend sweater, white t-shirt & tank: target, skinny jeans: banana republic, grey rosette necklace: allora handmade, boots: zappos and long yellow & grey stripe scarf: forever 21. 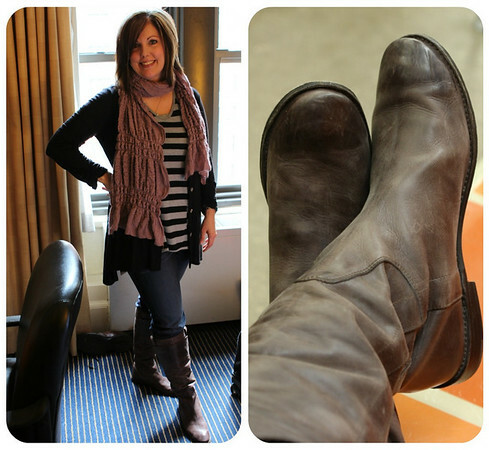 Day 3: long black cardigan & striped shirt: stein mart, skinny jeans: banana republic (shhh...it was a re-wear), mauve ruffly scarf: downeast basics, boots: frye paige (zappos). Day 4 (not pictured, oops!) But it was jeans, layered long sleeve shirt, grey drape-y sweater, and cowboy boots. Are you surprised? And yes, I wore my cowboy boots a lot because if they were good enough for Tim Riggins when he went with Jason Street to NYC (Texas forever!) on Friday Night Lights then they were good enough for me. 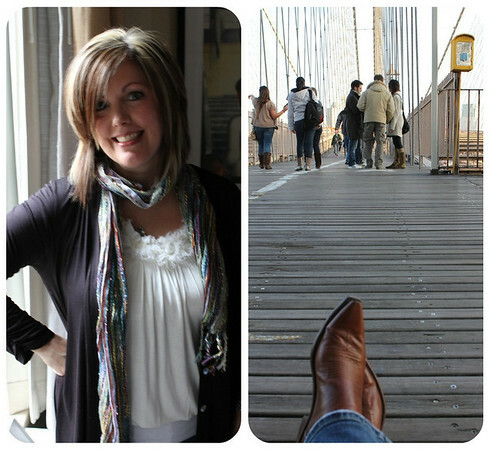 Day 5 (our last day, sniff, sniff): black cardigan: stein mart, beige rosette top: downeast basics, black/multi colored scarf: forever 21, jeans: lucky and my cowboy boots (pictured taking a short siesta on the Brooklyn Bridge). Which is what a majority of the people along the streets of NYC look like at this time of year, puffy coats, colorful scarves, hats and gloves along with jeans or leggings tucked into boots of every kind. And ladies, no matter where you are, please remember that tights are not appropriate solo leg attire and always double check to see that you have adequate nether region coverage before leaving home. Please. I'm begging. So there you have it, my NYC attire in a wordy nutshell. Thanks for popping in for a looky-loo. I'll be posting more about our trip over the next few several days so feel free to stop back by for another visit if you'd like. The more the merrier! I'm linking up with Lindsey at The Pleated Poppy so be sure to check out other WIWW posts over there. And I join you in your plea against solo tights. Please, please, women everywhere. Avoid. fun, fun, fun! you look great everyday! glad you stayed warm! I thought about that. 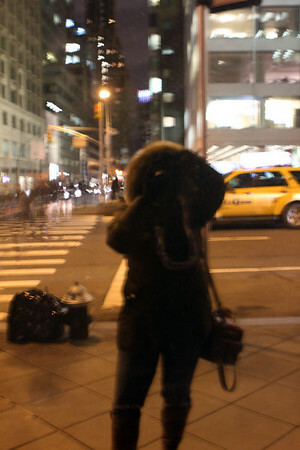 on my trips to montana and to boston, that was my main concern-staying warm!! can't wait to see more about the trip!